I have finished the tempation toe-down socks. Nothing wrong with them, except that they were so boring to knit. Just stockinette. And look at the awful piggy color. 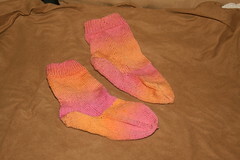 I like the orange/apricot color - but the piggy one really destroys the socks for me.